Researchers say a set of ancient tools found in a box at a Canberra university is the world's oldest known complete tattoo kit, thought to be made from human bones. Four tattooing implements were found along with what was believed to be an ink pot on Tonga's Tongatapu Island in 1963. Archaeologists knew the find was significant, but no one was sure how old the implements were. Australian National University's Geoffrey Clark and Griffith University's Michelle Langley teamed up to study the artefacts in detail, using radiocarbon dating technology to determine their age. It turns out they were 2,700 years old. 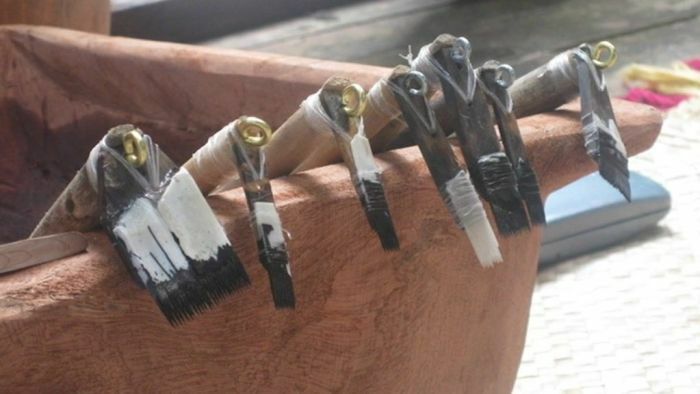 "The question has always been, were these tools introduced to the Pacific through migration, or were they developed in Polynesia where we know tattooing has a very prominent role in society and spread from there?," Associate Professor Clark said. "This discovery pushes the date of Polynesian tattooing right back to the beginnings of Polynesian cultures around 2,700 years ago." The pair documented their findings in a research paper published this month, which had even more surprising details. Two of the tools were made from seabird bones, while the other two were made from the bones of a large mammal. Associate Professor Clark said the bones could have been plucked from the graves of the tattooist's loved ones.